Super hero of natural food: Cacao! Cacao or Cocoa a super food which basically is immensely beneficial to us and is higher in healthy agents compared to most other foods. Cacao has been known to benefit cardiovascular health, weight management, and cholesterol and to be filled with antioxidants, magnesium and other vitamins, minerals and nutrients. How this wonder food is made to perform like a blunder food! Cacao beans in India are traditionally grown for the mass market. That means large companies buy the majority of the beans and thechocolate made by them has very little cacao (it can be as low as 10%) and is filled with vegetable fats, sugar, milk and other preservatives there is little focus on the quality and taste of the cacao bean. The main focus for these companies is the yield or productivity of the trees than quality. Unfortunately the majority of chocolate sold in India today is actually milk chocolates which contains very little cacao, lots of milk and sugar and is full of chemicals and preservatives. Also, it almost always contains a product called Compound. Compound is essentially a vegetable fat that is used to replace the cacao butter in chocolate. Compound is cheaper than cacao butter, tastes terrible, and is of inferior quality and quite frankly it is not chocolate! The large company doesn’t involve farmers in any post-harvest procedures such as fermentation and drying and these procedures are directly related to the flavour development of the cacao bean. Farmers often sell the wet beans directly to the large companies for very low prices. The larger companies buy all the beans (good and bad) because quality is not important for the product they produce. That means there is little incentive for the farmer to improve the farming techniques or the flavour of bean. Cacao should be kept as close to the natural form as possible to get all the health benefit it offers. Actual chocolates are the ones with minimal ingredients and remains dark without milk and less sugar. The ones which are organically and naturally made fromorganic beans, organic sugar and without chemicals, preservatives or emulsifiers are far better in taste and health preserving the wonderful flavour of the beans and also the health promoting agents found in cacao. The real chocolatiers like Mason & Co directly work with farmerswho are interested in improving their cacao crop and producing superior quality beans that they can sell for a fair price. Cacao can be had in the form of Cacao powder and cacao nibs that are used as ingredients in various food and beverage recipes likedrinking chocolates, cocoa butter, tisane (Choco Tea) etc. 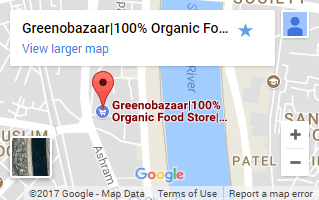 At GreenoBazaar we are committed to save the environment by promoting the use of authentic organic products and save your health.